As the days get shorter and the hours darker, you’ll start to see the colourful, sparkly lights of Christmas appear in the windows of many Dutch homes. 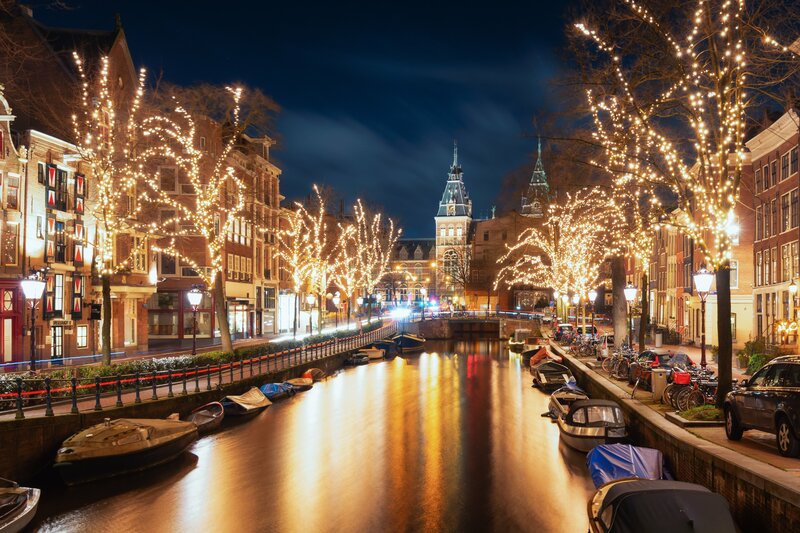 But what does Christmas in the Netherlands really mean? Here is an overview to some of its most important elements. Sinterklaas is a tradition/holiday in the Netherlands that begins mid-November and lasts until December 6th when Sinterklaas (St. Nicholas) leaves the country, heading back to Spain. During his time in the Netherlands children receive small gifts, songs are sung, and everyone eats chocolate letters, kruidnoten, and pepernoten. The celebration culminates on December 5th when Sinterklaas brings presents. Christmas in the Netherlands lasts not one, but two days. Making things easy, these are named Eerste Kerstdag (First Christmas Day – December 25th) and Tweede Kerstdag (Second Christmas Day – December 26th). Both days tend to be used in the same way – visiting family, eating and drinking, and relaxing. Many of the big shops are also open on Tweede Kerstdag, providing a valid escape for anyone who has had too much family time. Similar to many other countries around the world, the Dutch place a Christmas tree in their home, decorated with lights and ornaments. Live trees can be found at pop-up stalls, DIY stores, and garden centres. Artificial trees are also popular. To add to the festive atmosphere, you’ll also find Christmas trees in and around the city. Known in the Netherlands as the Kerstman (Christmas Man), this key Christmas player takes a clear second seat in popularity to the freshly departed Sinterklaas. When it comes to a traditional Christmas dinner in the Netherlands, almost anything goes. Instead of a steadfast traditional dish, families tend to pick something they would extra enjoy eating, is a little special, or even go out to a restaurant. Gourmetten (meat, vegetables, etc. cooked on a communal table top grill) is also popular. Christmas themed snacks are in ample supply, from festive shaped cookies and chocolates to kerststol – a fruit and almond paste filled sweet bread. Tip: Missing your eggnog? Grab a glass of advocaat. Advocaat is a thick, eggnog-like drink spiked with brandy.